1. The ones searching for vision. I want to show you a simple + practical way to find vision/purpose for your life. 2. The ones who have a vision and want to put it into action. The steps here will help you put the big-picture vision into small, actionable steps..
3. The ones running with zeal after a vision and want balance in the other areas of life. I want to share how I’m finding balance in all the things. 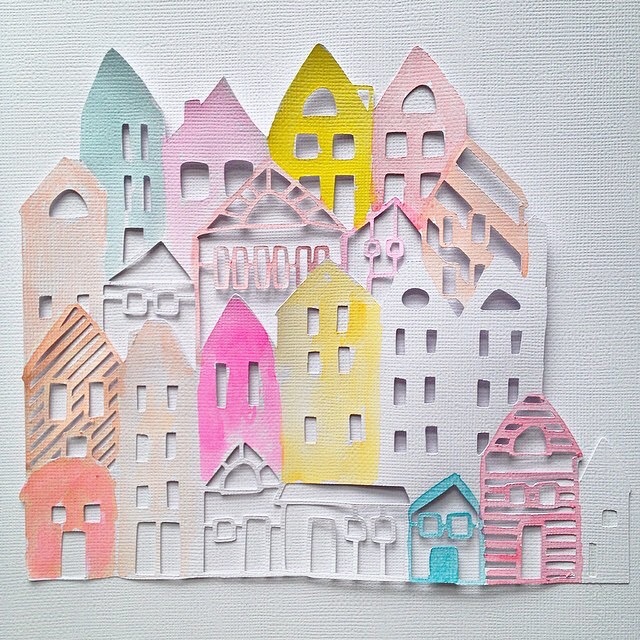 I think the best way I can start is by sharing how I cast vision + plan all the life things. The Lord gave me a blueprint for Vision Sheets, a set of worksheets designed to help find/define the vision and purpose He has for my life. Can I commission you to have a conversation with God? Spend a little time waiting on Him before diving into the Vision Sheets. Let your soul get quiet, your eyes to see yourself + your world through Jesus’ eyes. We work from a place of restedness + security, otherwise we burn out. Because chasing man-sized dreams may work for awhile, but will ultimately leave us feeling unsatisfied. We don’t compare where we are to one another, or others’ calling against our own. 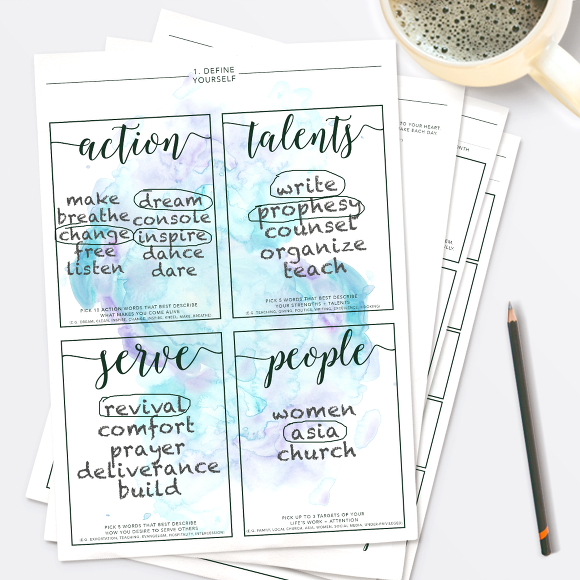 These Vision Sheets were created to help you find purpose – whether you are a full-time mom or a full-time entrepreneur – wherever God plants you. Because God ordains fruit from wherever He’s placed us. Also, there’s grace. We will fail and make mistakes. But we learn, and God’s love + grace covers us. The vision and goals written on the Vision sheets aren’t set in stone. There is room for God to move, you to grow, priorities to change. You can redo them as often as you need to. There is freedom in God’s order. 1. Start with the big picture, then break it down into small steps. The big picture gives purpose + direction, and helps refine the decisions I make today for tomorrow. Vision Sheet #1: Define Yourself. There are 4 categories, each one helping to narrow down the passions, gifts, and people that God has called me to. I use this sheet to take small steps towards defining my vision for the new year, but it’s also good to re-evaluate every few months because certain seasons call for different perspectives/priorities. Vision Sheet #2: Write The Vision. This sheet further refines the items in sheet #1 into a one-sentence summary of what really fires me up. That is my vision for the season, and it guides my daily decisions pertaining to what I say “Yes” or “No” to, so that I do more of what feeds my soul + spirit. Vision Sheet #3: Your Core Goals. This is a monthly worksheet. It breaks down the big-picture vision into smaller, practical steps for the month. I first identify the top 3 things I feel I should be focusing on that month, then plan my monthly goals around those priorities. The “Pillars” section of this sheet is super important. It’s where I write my weekly/monthly non-negotiables. *More details on this section further down. Vision Sheet #4: This Week’s Steps. Once I have a broad overview of the goals I want to achieve for the month, I break them down into actionable steps each week (you could do it by laying out all 4/5 weeks at once, or going one week at a time). First, I put down all the Pillars into my week – these are the non-negotiable items that should be blocked out before I add any other items to the agenda – a day for rest, a date day with Alex, a day for groceries + cleaning, and times for exercise + QT in the mornings. This has greatly helped me as I learn to grow in balance + well-roundedness. Next, the weekly plan. I like to make sure that at least 80% of my time is spent on tasks that revolve around my top 3 priorities from worksheet #3. 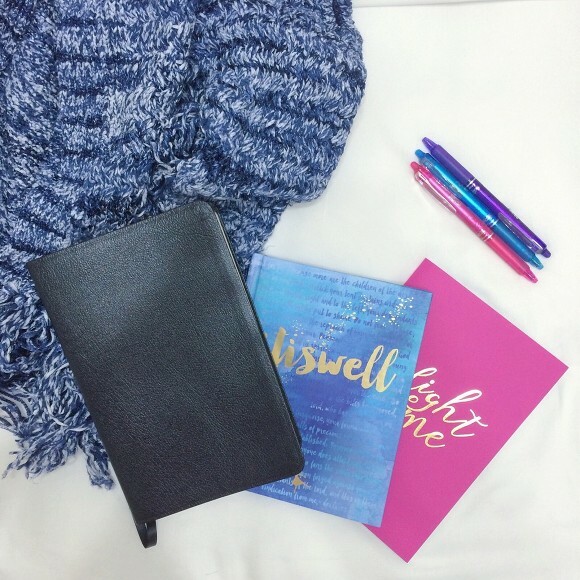 My first priority currently is writing, so I make sure to schedule in plenty of time everyday to write – I blog, write books + devotionals, etc. Sabbath rest. A day each week to rest and spend time doing things with God. I do things that let my mind rest, my soul breathe, and my spirit soar. Sometimes I watch a movie, go shopping, or stay home in my PJs. It doesn’t matter what I do as long as I’m doing it with Him. Date day. We have a designated day of the week that we block out – we don’t make other appointments on this day. Alex and I spend the day together doing anything and everything we want together. We keep it flexible, fun, and restful. A day to get to know each other all over again. A day for fun, romance, and whimsy. Quiet time. A block of time before I start work each day. The best (fruitful + productive) days I have always begin with prayer. I always end up achieving more when I pray than I do on days that I jump straight into a 12-hour work day. House cleaning. I’m a bit of a hygiene nazi. I’m more rested now, but I still like my home clean + pleasant to live in + conducive to creativity. I do a thorough house deep-clean twice a month, on alternate weeks. Every other night, I do a quick wipe around the kitchen + vacuum around the house which takes about 15 minutes tops – this helps keep cleanliness levels without being too time consuming. Exercise. Alex and I try to do about 90 minutes of weight training + cardio every other morning. Some days we’re too tired to get out of bed. There’s a lot of grace in this, and we just make it up if we miss a day or two. It’s been really good for me, not just physically but also emotionally, mentally, and even spiritually. Groceries + Meals. Grocery shopping has become a really fun experience for Alex and I. It is somewhat of an adventure for us to go to the supermarket once a week and buy all the meal ingredients for that week. I’ve started cooking all our meals at home because we want to eat healthy + save all the money we spend eating out on more important things. It’s fun to do things like experiment with 3 different ways to use 1/3 of a Green Pepper this week, so we fully utilize everything we buy and keep the menu interesting at the same time. It’s gotten pretty easy to cook meals through the day. In the mornings, I put whatever Alex/I feel like eating on to cook, then we work out and the meal’s ready by the time we’re done – I usually cook a double portion so we eat half in the morning/afternoon, and the other half is used to create an entirely new dish in the evening. It’s quick, fun, and so cost-effective. Personal grooming. One day a month I do all the necessary personal grooming things – hair cut, spa/facial, etc. Not the most important things, but still needful. Because my body is the temple of God and I want to pursue beauty apart from vanity. And that’s it. Boy that was a ton of information; if you have questions, ask them in the comments! If you’re interested, these things help me in my waiting on God + vision planning: journal, notebook, Bible. ALSO! I get a lot of emails and texts that I really wish I had time to dig into and answer fully, so I am SO excited to let you know that I am opening up mentoring slots for individuals/groups who maybe want some guidance as they work through finding + defining their life vision + purpose. 90 minutes of face-to-face (or Skype, if you live outside of Singapore) mentoring time with Samantha. This includes prayer, hearing from God, and working through the Vision Sheets together. One month of email/phone mentoring as you work out the Vision Sheets in your life. One set of A4 Vision Sheets. One to-do notepad for all the lists. One mug from the Godly Womanhood Shop. 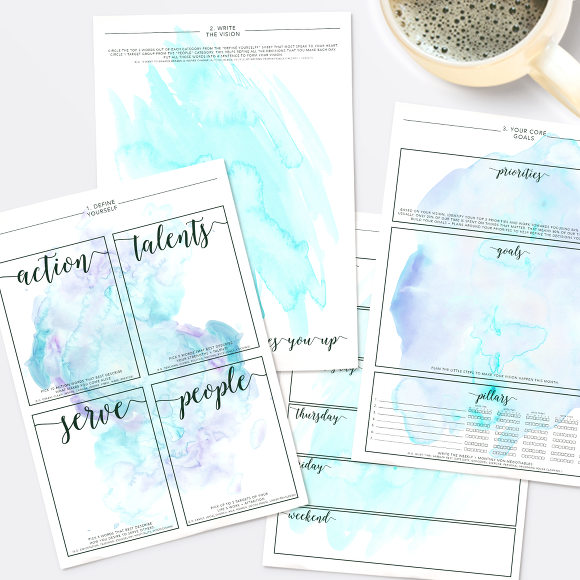 A digital download of all the worksheets so you can re-use them whenever you want. A 90 minute individual session is SGD$100. Please fill out the below form if you’re interested! Or you can go straight here to book your session. If you’re a group of friends / small business team interested in team coaching, we can discuss group rates. If you feel you need more than one session, we can discuss package rates. Thank you so much for sharing these, and how you are using them. 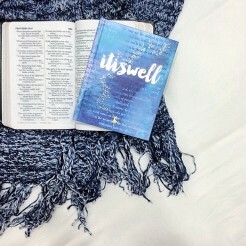 I can’t wait to dive in and be guided by the One who has great plans for us all. Samantha, this is wonderful and just what I needed to read through today! What a beautiful and intentional heart you have. Thank you for the promo for the free prints – I have been looking to design some, but haven’t had time to. Also, I’m swooning over your entire shop but especially The Mourning into Dancing series. I’m a dancer, so naturally I want to buy everything, haha. I’d love to connect with you about collaborating in the future. Samantha — I will be featuring this post on my blog on December 31st. Thanks for the BEaUtiful creativity!